Tags: RightsNow Pakistan condemns the arrest of a leading human rights activist Adilu Rahman on fabricated charges. 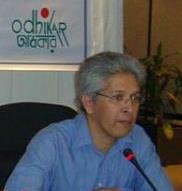 Adilur Rahman Khan, Secretary of Odhikar, former Deputy Attorney General and an advocate of the Supreme Court. RightsNow Pakistan condemns the arrest of secretary of Odhikar, a Bangladesh based human rights organization arrest by Metropolitan police under fabricated charges. Adil is a leading human rights defender,former Deputy Attorney General and a Supreme Court lawyer. Adiul Rahman was arrested on 10th August on charges of fabricating infromation about attrocities committed earlier this year. Police arrested him while he was returning home with his family. Ali Palh, a lawyer, human rights defender, executive director, RightsNow Pakistan a Pakistan based human rights organization condemned the arrest of Adiland said he is being victimized for his human rights protection work and for his organizations’ work which has been very critical of human rights abuses committed by Bangladesh Government. Mr. Palh said Adil’s arrest will have a negative impact on the security of huamn rights defenders in South Asia. It will negatively affect the human rights situation in South Asia.